This high tech unit concentrates the sun's energy at the tip of the copper 'heat tube' - like a solid state magnifying glass! 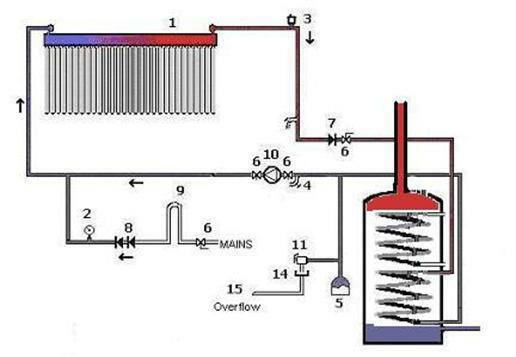 The heat transferred to the tip of the heat pipe is in turn transferred to a copper manifold in which water circulates to heat the domestic hot water tank. If a tube is placed in direct sunlight on a summer day, the tip temperature can reach 250°C - so the system easily heats domestic hot water cylinders to 60°C even in cooler weather! The manifold is heavily insulated with a 2" thickness of pre-formed rockwool to keep the heat in. Unlike flat plates, these headers are so well insulated that they should not require antifreeze in normal operation - the temperature of the header is unlikely to fall below 10°C even in very cold weather. The more advanced solar controllers include a low-temperature facility- should the temperature of the collector fall below a defined level, the pump will operate to allow the the water at the bottom of the tank to heat the collector slightly. In normal conditions, this would never be necessary - but it acts as a good safety margin. How Much Heat Will I Gain? How Do I Connect the Panel? What else will I need to go with this panel? It depends on your application and the method you employ. The simplest system would be based on thermo-siphon (convection or 'gravity feed'). The panel would be mounted lower than the hot water cylinder, when the sun shines, the hot water will rise, and displace the colder water which returns to the panel. This system requires no additional energy, no control system and is self-regulating, simple, cheap and effective - but not very convenient for most situations. 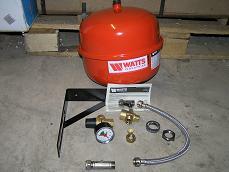 In this case, you will only require the header tank or pressurised system kit plus copper tube and insulation. Swimming pools are an ideal application for solar water heating, as the temperature required is quite low - under 30°C. Most installers will recommend flat plates to keep the price down - because the amount of panels required is much larger than for heating domestic hot water - however, if you can buy a high efficiency evacuated tube solar panel for the same money - you might as well enjoy solar heated pool water all year round - instead of just in July and August! If you used flat plates, a rule of thumb for calculating what you need is to fit the equivalent of 50% of the pool's surface area. For Vacuum tube panels, this is reduced to 25% - and of course, they will carry on working in the autumn, winter and spring. The Navitron panel is 2.25m2 so each panel will heat 11m2 of pool area. A 40m2 pool would only need 4 panels . Compare this to the cost of heating a pool for a year! Installation is very simple. If you have chlorine you will need to fit a stainless steel heat exchanger (this is because chlorine causes copper to corrode). These are available from pool suppliers (they are needed for conventional heating methods for the same reason). If you dont have chlorine, you can simply put the solar panel in-line with the pool filter, so that the pump directs water through the panel before returning it to the pool. As the panel will NOT radiate heat on cold days, heat losses will be confined to your pipe runs only - so you do not necessarily need a controller, although one can be fitted, to control a 3-way solenoid valve to divert the water through the panel when the panel is hotter than the pool water. Flat plate collectors only provide a useful amount of heat during the summer months in the UK. due to their high heat losses during cold or windy weather. When the ambient temperature drops, the heat loss can easily exceed the heat gain - turning your flat plate solar collector into a radiator! The reason for the popularity of flat plate collectors is their cheap construction - you can build one yourself for a few pounds worth of scrap material, or you can buy one for £300-500. This is typically a lot cheaper than evacuated tube panels, which typically cost £800-1200.......until now! Don't fit a dinosaur! There are some flat plate systems for sale in the UK, such as the Solar Twin system, which use plastic, silicone or rubber pipework, which makes installations easier and to reduce costs. Whereas this pipework may be ideal for flat plates, it is definitely not adequate for evacuated tubes. On a hot sunny day, flat plates may heat water up to a temperature of 60°C. 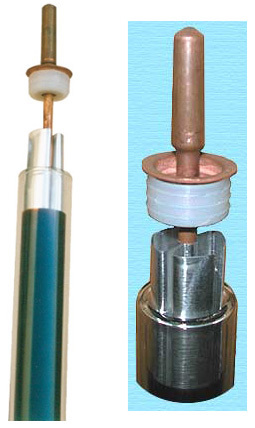 Evacuated tube systems are capable of heating the water beyond 140°C. Most plastic pipework has a working temperature of no more than 65°C, and is able to stand no more than 90°C - so you should always use copper for solar installations. You can buy the other components from me, or from elsewhere - you chose! Solar energy is the cleanest and most inexhaustible of all known energy sources. Solar radiation is the heat, light and other radiant energy that is emitted from the sun. The sun's energy, although plentiful, has been hard to directly harness until recently. Solar water heater converts solar energy into thermal energy, then heat the water step by step. The beauty of this system is it does not create pollution or harmful emissions, and is extremely economical - the fuel (sunshine) is free! Plus, they are environmentally friendly. To take full advantage of these heaters, you should ideally have an unshaded, south-facing location (a roof, for example) on your property, although they can be utilised at ground level also. This type of Solar water heater is now extremely popular in many areas of the world, are are now becoming much more popular in the UK, due to their high efficiency. Until now, solar panels were not particularly popular in the UK due to their low efficiencies during the spring, autumn and winter months. Classic solar panels (flat plate collectors) work equally well as radiators - and therefore unless ambient temperature is high, heat losses are considerable. Flat plate collectors, despite their poor performance at UK lattitudes, have remained the panel of choice until now, due to their low cost, and DIY-suitability. However, we are now able to offer much higher efficiency vacuum tube collectors at similar prices to flat plate collectors. Higher efficiency and greater installation flexibility with heat to many of the more expensive brands on the market - as the tubes and headers are all manufactured in the same factory by an OEM supplier. Panel ordering information. Note- We will not post these to you, we would prefer you to either collect from us or arrange a carrier.